The Frost Warnings that were widely scattered across Pennsylvania last night gave me reason for major concern. I had just recently transplanted all of my frost tender heirloom tomatoes, peppers, and eggplants out into the garden’s unprotected raised beds. It has been unseasonably cool over the past few days but the frost warnings still caught me by surprise. Our average last frost date is behind us, but yesterdays warnings are a reminder that the possibility of frost remains even into June in Pennsylvania. My biggest concern was for the heirloom eggplant varieties that had been raised indoors from seed. If these cold sensitive plants were lost it would be too late to replant and impossible to locate and replace the unique varieties at a local greenhouse or garden center. Eggplants are usually among the last transplants that I set out into the garden, but I couldn’t resist the opportunity to plant them during last week’s rainy and cloud covered days. The ironic thing is that the lack of a cloud cover to insulate the ground was one of the factors contributing to last night’s threat of a frost. As I pondered my options to protect the garden, in addition to a prayer or two, I decided to cover as many of the peppers and eggplants as possible. I first thought of using sheets of newspaper but then remembered that I had a few large pieces of floating row covers left over from last season. The peppers and eggplants were growing inside of short three foot tomato cages so that made it simple to drape the row covers right over the plants, cages and all. The protective fabric fit perfectly across the raised bed with enough material left over to tuck underneath of the cages to secure the cover and prevent it from blowing away. An old sheet would have worked just as well to form a temporary covering, but could not be left in place during the day as you would with a floating row cover. Another option to provide frost protection includes using plastic bottles or jugs that have their bottoms removed and can be placed directly over individual plants. Even empty flower pots, window boxes, and planting containers can be employed to cover and prevent frost damage to sensitive plants overnight, but again they should be removed the following morning after the threat has passed. Portable cold frames can also be set up and placed over the area of the raised beds containing the susceptible vegetable seedlings. You can look to the sky for clues regarding the likelihood of frost conditions. As mentioned earlier a cloud cover overhead usually helps prevent the formation of frost by trapping the warmth that radiates up from the earth. 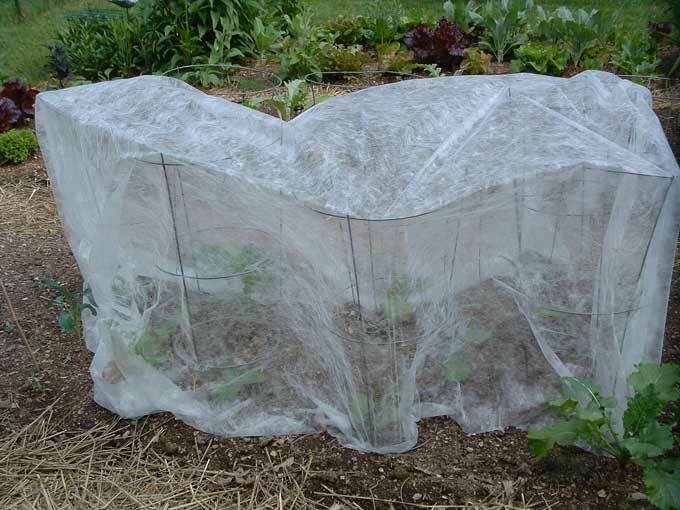 Precipitation will also eliminate worries and prevent frost damage to tender vegetable plants. As it turned out everything was fine this morning. The warnings turned out to be a false alarm; there was no frost in the garden or damage to any of the vegetable and herb plants that are growing in the raised beds. The floating covers are still in place and would have worked well to protect the eggplants and peppers against a light frost. Now I plan to leave the row covers over the eggplants for a while to provide a little additional warmth and hopefully deter the flea beetles that always show up to chew holes in the leaves of the eggplants. Hey, just wanted to say thanks for your ideas for frost protection covers. I was in a panic and not sure what would be best. THANKS! Hi Alessandro, the floating row covers are made out of some type of synthetic material, maybe some type of polyester. It is very sheer, thin, lightweight, and almost transparent in some places. Thank you for sharing this tip. I will definitely look for covers.